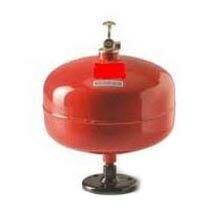 We offer good quality Ceiling Mounted Fire Extinguisher that works automatically without any any external support. With portable size, it is easy to instal and relocate and can be utilized for local applications or total flooding of hazards. Ceiling Mounted Fire Extinguisher works on sprinkler technology which is accompanied with air tight nozzles. Ceiling Mounted Fire Extinguisher, we offer, is most ideal for protecting areas where like computer area, ATM Centre, server room, fuel and flammable liquid storage, oil fill-in stations, transformers, automobile garages, marine engines, paint and varnish booths, welding benches, etc. It is also suitable for preventing fires in isolated areas with lesser human presence but the fire should be detected at the early stage. The storage room, warehousing unit and server room of an organization specifically need these fire modular devices to be installed. In case of a fire event, it activates automatically, spraying the extinguishant with maximum force, ensuring that the fire is controlled rapidly and efficiently. Also, these are available in ABC powder and clean agent variants and are effective against virtually all classes of fire.